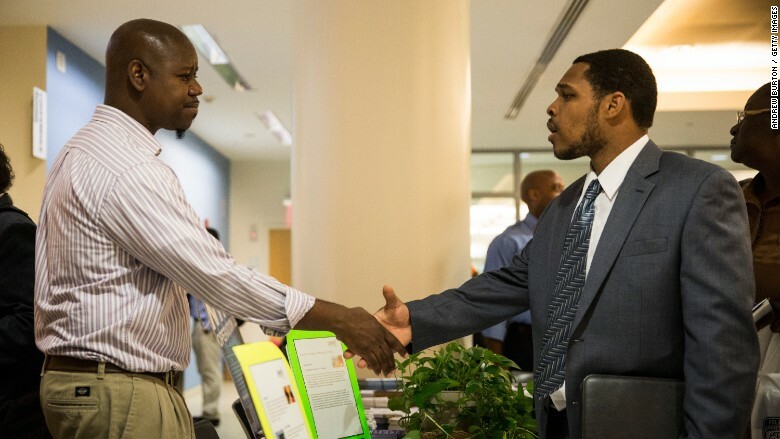 Unemployment for blacks fell below 10% in April for the first time since the financial crisis. Crossing that mark is a reminder of how far the economy has recovered, but also how severe the recession impacted blacks in the U.S. Blacks got hit the worst of any race when the economy collapsed in 2008. Unemployment peaked at 16.8% for blacks in March 2010. Unemployment for whites was almost half that rate. Overall, the national unemployment rate fell to 5.4% Friday, its lowest point since 2008. But unemployment is still higher for blacks than any other race -- 9.6% in April. "That definitely is a positive step in the right direction," says Valerie Wilson, an economist who covers race and ethnicity issues at the Economic Policy Institute. "But it's also an indicator of how much more progress needs to be made for African Americans." Despite being almost six years into a recovery, the employment picture for blacks looks particularly grim in some states. Blacks in Illinois have an unemployment rate of 12.5% -- more than double the national average. Michigan, Pennsylvania and California are above 12% too, according to an EPI report. The good news is that those rates have been steadily going down in the past year. Part of the wide gap in unemployment between races can be explained by education. Fewer blacks finish high school than whites, limiting their job options. But education doesn't illustrate the full picture. Blacks with the same education levels as whites still have a harder time finding work. And despite more blacks having college degrees than Latinos in the U.S., Latinos have a lower unemployment rate, according to Labor Department and Census data. Blacks with the same credentials as whites and Latinos also earn considerably less. The median weekly paycheck for a white college grad last year was $1,132. For a black college grad it was $895 -- over $230 less a week. Blacks earn less than Asians and Latinos as well. Blacks access to employment networks and opportunities -- for example, job training -- play a role too. Discrimination among employers, whether conscious or not, factors into the black employment picture as well, experts say. "It's not time to cheer and say 'mission accomplished,'" says Wilson.